“Peace Negotiator” Mike Pompeo: There is a CIA Plot to Assassinate Kim Jong-un? 5.4 out of 5 based on 5 ratings. 5 user reviews. Neither the CIA nor the White House responded to these accusations. While press reports acknowledged the CIA’s “long history” of political assassinations, the DPRK’s accusations were casually dismissed. Guardian screenshot, March 5, 2017. What the Western media failed to notice was that the alleged assassination attempt directed against Chairman Kim (May 5, 2017) took place 5-6 days AFTER Mike Pompeo’s arrival in Seoul on the weekend of April 29-30 for (unannounced) consultations with his intelligence counterparts on May 1. Is it relevant? The matter needs to be carefully investigated. The timing of Pompeo’s meetings in Seoul was crucial: in early May 2017, the intelligence team at the ROK National Intelligence Service (alias KCIA) headed by Langley’s crony Lee Byung-ho, was STILL under the control of the appointees of impeached president Park Geun-hye (daughter of the late dictator Park Chung-hee assassinated in 1979). South Korean media confirmed that Pompeo had behind closed doors meetings with NIS spy chief Lee Byung-ho as well as “high-level officials in the presidential office” which was under the helm of Park crony and acting president Hwang Kyo-ahn (who held the positions of Justice Minister and Prime Minister in the government of impeached president Park). Screenshot of Lee Byun-ho who met Pompeo behind closed doors on May 1, 2017, Source KBS World Radio. Following Moon’s accession to the presidency on May 10 2017, a new head of the ROK National Intelligence Service (NIS) Suh Hoon was duly appointed. While a major shuffle was undertaken within the spy agency, Suh Hoon’s appointment had nonetheless been (formally) approved by Langley. 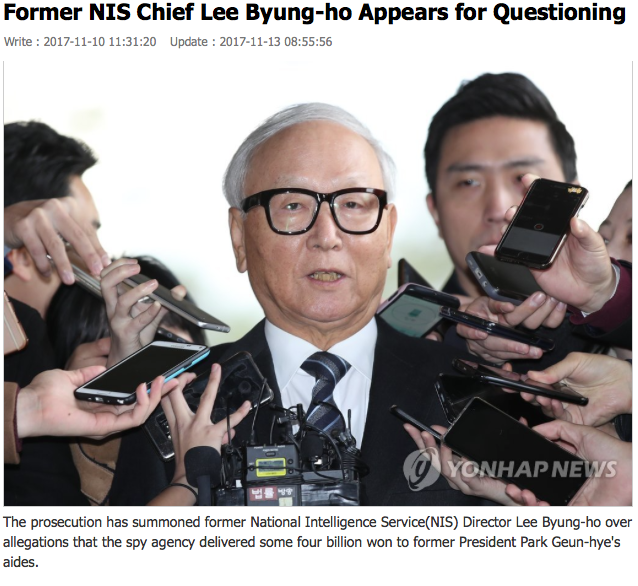 The important question: has the CIA lost control of its historical clutch over the ROK’s National Intelligence Service (NIS)? 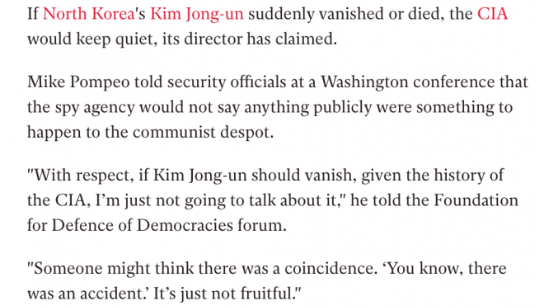 In a bitter irony, a few months later in October 2017 (see SCMP report) CIA Director Mike Pompeo (now Secretary of State) jokingly denied and acknowledged (without referring to the May 5, 2017 alleged assassination attempt during a military parade in Pyonyang) that there is a plot to assassinate Chairman Kim, which is part of the CIA’s longstanding history of political assassinations. .
“With respect, if Kim Jong-un should vanish, given the history of the CIA, I’m just not going to talk about it,” the CIA director said on Thursday, when asked what would happen if Kim suddenly died. In a bitter irony, the same Mike Pompeo who casually refers to the “CIA history” of political assassinations, has come to play a central role in the “peace” negotiations with Pyongyang. The ROK’s NIS Chief Suh Hoon together with Moon’s National Security Advisor Chung Eui-yongwere put in charge of a process of trilateral negotiation: DPRK-ROK-US, with ROK officials operating as a go-between. On March 6, Chung Eui-yong, together with four other senior ROK officials including Suh Hoon, met up with the DPRK leadership in Pyongyang. This meeting on March 6, 2018 had set the stage for the former CIA director’s followup “secret meeting in Pyongyang”: Mike Pompeo who had intimated that political assassination of Chairman Kim was on the CIA’s drawing board travelled to Pyongyang over the Easter holiday for talks with the DPRK leadership with a view to negotiating the terms of the Singapore Summit which had been set for June 12. North Korean leaders were fully aware of Pompeo’s real intent. They nonetheless played the game. Peace was never on the US agenda. And this was true prior to the appointment of John Bolton as National Security Adviser. The objective is to shunt the inter-Korean dialogue and impose a unilateral process of “denuclearization”. The Kim-Moon dialogue is viewed by Washington as a potential obstacle. Acknowledged by Pompeo, there is a CIA Plot to assassinate Kim Jong-un. Is it Pompeo’s Plan B? In recent developments, following the Moon-Kim May 26 meeting on the North Korean side of the Panmunjom truce village of the DMZ, President Moon said that he was “perplexed” by Trump’s decision to cancel the Singapore summit and urged Washington and Pyongyang to resolve their differences through “more direct and closer dialogue”. A Yellow Stone Eruption would be a welcome Liberation Providence for the World ! Except of course a disaster that can cover the entire continental US with ash and devastion would probably also be equally cataclysmal to the rest of the world. Such disasters do not tend to end at national borders. Why not have the dollar and US economy collapse? That would be also a cataclysm for the world wide economy, but at least one that we can all survive. no more food and arrogant overweight Yanks ! aint just the yanks who are arrogant and overweight m8. to eat All is the World worst…. Because the dollar wont collapse until it is allowed to collapse. The Petro dollar bolsters the US dollar, while the bankers decide its fate by running the printing press. All they need to do, is print more of the infinite supply of money that is backed by the purchase of oil in US dollars. A yellowstone supervolcano eruption would screw the entire world, including you my friend. Don’t wish for it. you would perish in a Yellowstone supervolcano eruption event as well as just about every last living human human being on earth. It would emitt more than 1000 cubic kilometers of dust and sulfer-dioxide into the uupper atmosphere blocking out the sun for decades. Insects wont survive, they’re higly dependant on the sun and warmth. The last mass extinction event killed out the dinosaurs but some reptiles such as the crocodile survived, and some insects lay eggs that can remain dormant until conditions are right. Man will probably go, but in the life of this planet, will that be important? And no more CHEMTRAIL(GEOENGINEERING) AND UNITED NATIONS NEW WORLD ORDER. Unfortunately MerKKKel and the other EU criminals would simply continue where the US left off. Thereby saving the galaxy from human colonization. The World needs peace, the US and others, cannot carry this crap on; it is just shear insanity. Wow, what a news! They’ve been tried EVERYTHING to kill Fidel Castro, in terms of 70 years and more, and every single plan has failed. And this insanity that Pompeo talks about is next to impossible. They(CIA) KILLED Hugo Chavez in conjunction with the MI6 when Chavez when to England to collect the Venezuela gold that England have, they give Him poison food/drink of slow but deadly reaction(THEY WANT TO DO THE SAME TO MADURO), the Venezuela government know all the details. You never read that in the english controlled press, you has to read Spanish publications to find the true. I suspected that. I never heard that he went was in UK. All it seems is that they’ve poisoned him with small amount of Polonium, which causes symptoms of cancer. ABORTION RIGHTS IN WEST GUYANA! Mmm are you sure every American assassination failed? A lot of South American leaders who were critical of the USA got cancer, they killed Gaddafi, sometimes they kill the loved ones of targets? Quite often they just kill an opponent politically, like Lula in Brazil. Politicians all over the world are terrified of the USA, and rightly so. they are working towards peace. Using mass murder. The whole point of the imperialism and invasions is Agenda 21. Globalism. Never fear, one day we will live in peace and tranquility, basic income serfs here to service the rich. Feudalism will once again reign supreme. It is quite possible, especially this US’ behavior is VERY questionable. Or, even better for the crazies, a plot to assassinate the South Korean president and blame it on the DPRK. This way they remove the annoying president Moon with his pesky nuisance of making peace. That’ll teach all the peacemongers of the world a lesson not to forget! Maybe that’s why the meeting with Trump seems to be back on — perfect opportunity to assassinate Kim. Maybe the meeting is back on because all this speculation is BS from air heads. NK can be a good trading partner and Trump, in case you haven’t noticed, is all about the money. This is more than likely apart of the extreme rhetoric of the area. While it’s plausible that the CIA might plot this removing a national leader is difficult and complicated even in places that aren’t isolated from the outside world. Besides the security to overcome one must consider the political fallout (no one wants nuclear war), and who will likely replace the leader. And judging by the use of an ambiguous and indefinable term for some sort of nasty weapon, I’m going to say that this is simply a rhetorical move. Mike Pompous doesn’t know much, but he does know he likes hurting and killing people. and if that dont work, finally they invade…..